Heavy rain and strong winds occurred last night November 18 in Ho Chi Minh City , causing 149 houses unroofed, hundreds of trees in district 9 and Thu Duc district uprooted. 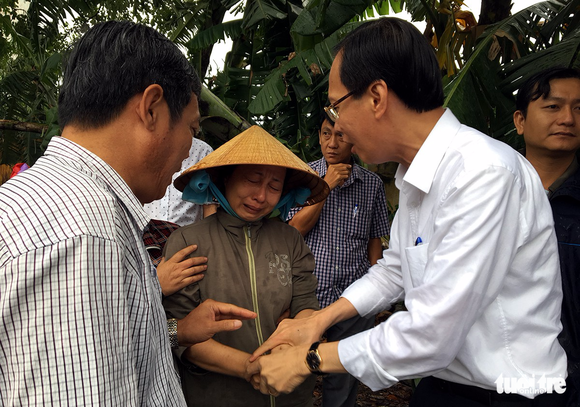 This morning, Deputy Chairman of the Ho Chi Minh City People's Committee Le Thanh Lien and district 9’s leaders and Thu Duc visited effected-families. Mr. Liem asked local authorities and related agencies quickly overcome consequences. In district 9, there were 15 unroofed houses while some 134 houses in Thu Duc were damaged and hundreds of trees in two districts were uprooted causing massive power cuts in Thu Duc district.